My mother is one of my best friends — however, she also still remains my mother in that she gives me advice, chides me, supports me in a way only a mother can. And, she does support me. She is always there for me to talk to or ask for help. I appreciate how strong and wise she has been in so many ways. Her birthday is today and about a week ago I went into my fabric stash (expanded in large part due to her giving me a shopping spree at a fine fabric store’s going out of business sale) because I wanted to sew a gift for her. As I was pulling out things from the back of the stash, a nearly finished length of hand-sewn quilt fell out. It was a something I picked up from my grandmother’s when she told me to take anything I wanted out of her fabric stash. 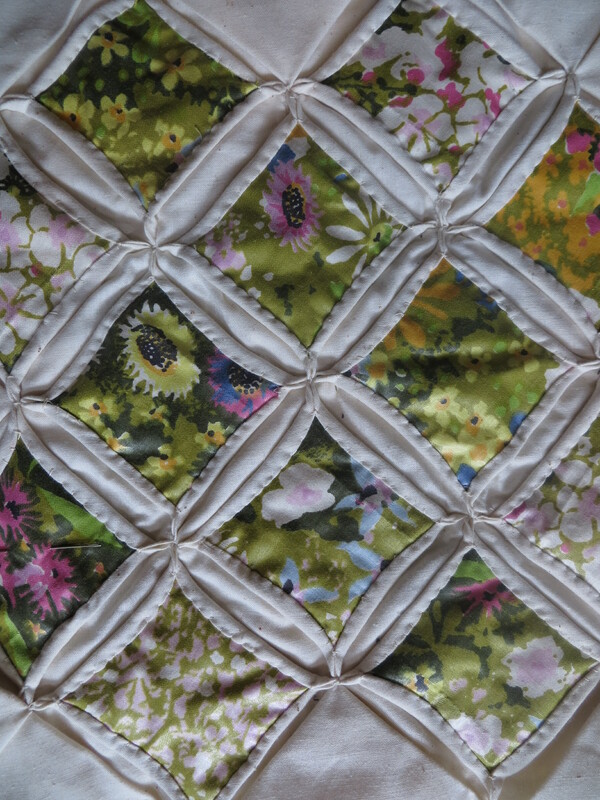 A length of squares sewn together, and some solitary squares, all hand pieced and quilted and made from the bridesmaid dress my mother had worn in her sister’s wedding about 40 years ago. 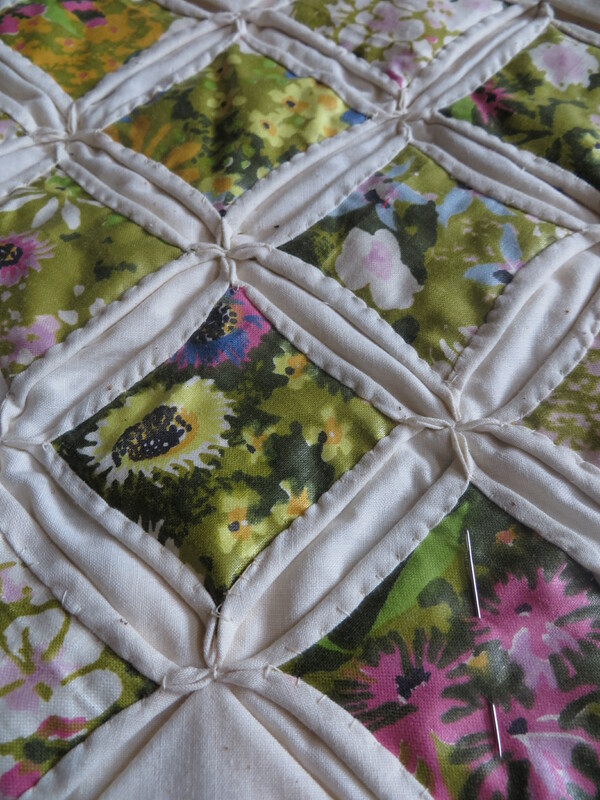 It was beautifully cut and sewn but the project (was it going to be a bed quilt?) was abandoned. I decided to finish the section I had to make a table runner out of it for my mother. Her mother has a large part of this gift as well, as she had the plan and did all the cutting and sewing. I just finished this piece. The colors and pattern are not really my mom’s style, but I thought it was too beautiful to pass up and that it would look great on her dining room table. My mother did like it and I am so glad that it might be used and shown off, finally, after all these years. It is truly beautiful and deserves some admiration. Just like my mom! Can’t wait to see it in person. It is lovely. Molly it is so pretty! can’t wait to eat a meal at your mom’s table with that runner as the centerpiece! Thanks, Susan. Hope to see you there!